Belladonna* Collaborative, Brooklyn Public Library and Asian American Writer's Workshop are proud to co-present Abdellah Taïa. Additional support has been generously provided by Seven Stories Press. 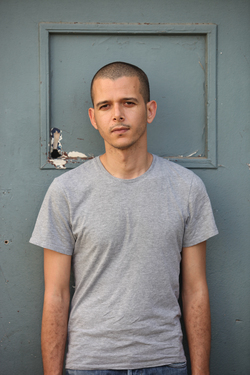 In 1973, ABDELLAH TAÏA was born in the public library of Rabat in Morocco, where his father was the janitor and where his family lived until he was two years old. He is the author of six novels, including Salvation Army and An Arab Melancholia, both published by Semiotext(e), and Infidels (Seven Stories Press). His novel Le jour du roi, about the death of Morocco’s King Hassan II, won the 2010 Prix de Flore. He also directed and wrote the screenplay for the 2013 film adaptation of Salvation Army. His books are translated into many languages. Taïa made history in 2006 by coming out in his country, where homosexuality is illegal. His commitment to the defense of homosexuals in Muslim countries has made him one of the most prominent Arab writers of his generation—both “a literary transgressor and cultural paragon,” according to Interview magazine. He has lived in Paris since 1998. MEENA ALEXANDER is a prize winning poet and scholar. Described as "undoubtedly one of the finest poets of contemporary times," by The Statesman (India) she has two new books forthcoming in 2018: her volume of poems Atmospheric Embroidery (TriQuarterly Books/ Northwestern U Press) and the anthology she edited Name me a Word: Indian Writers Reflect on Writing (Yale U Press). Her honors include grants and fellowships from the John Simon Guggenheim Foundation, National Endowment for the Humanities, Fulbright Foundation, Rockefeller Foundation, National Council for Research on Women, Arts Council of England, the Imbongi Yesizwe International Poetry Award from South Africa, and New York Foundation for the Arts, as well as the South Asian Literary Association’s Distinguished Achievement Award in Literature. She is Distinguished Professor of English at the Graduate Center/Hunter College, CUNY. Curated by Ana Paula, Asiya Wadud, Sophia Hussain, and Vanessa Rosenbaum.